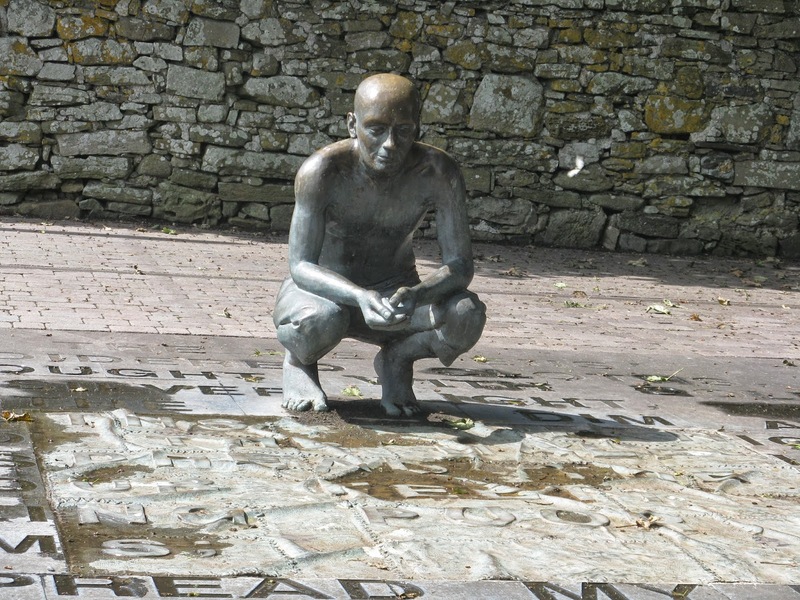 Freedom and Flourishing: Do I understand the meaning of W B Yeats' epitaph? I know that poetry can sometimes convey thoughts and feelings that tend to get lost in prose. Nevertheless, I don’t read much poetry. Reading poetry has always seemed like something that I could do when I become older. Even so, I have recently been reading some of the poetry of W B Yeats. My interest was aroused by the epitaph on his gravestone in the cemetery of St Columba’s Parish Church at Drumcliffe in County Sligo, when we visited Ireland during August. What could Yeats have meant by suggesting that we should cast ‘a cold Eye’ on ‘Life’? 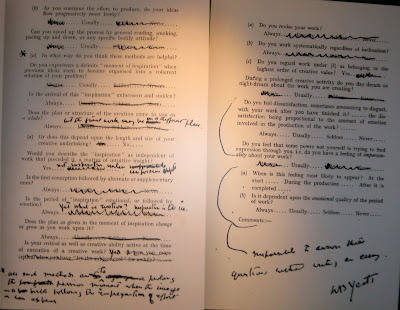 Before trying to answer that question it may be worth considering why we should care what Yeats meant. I think we should show some interest because he has been widely held to have been a literary genius. He won the Nobel Prize for Literature in 1923, for what the Nobel Committee described as ‘inspired poetry, which in a highly artistic form gives expression to the spirit of a whole nation’. His poem, ‘Easter 1916’, about the participants in the rebellion that occurred at that time in Ireland, comes to mind as a poem that might warrant that description. 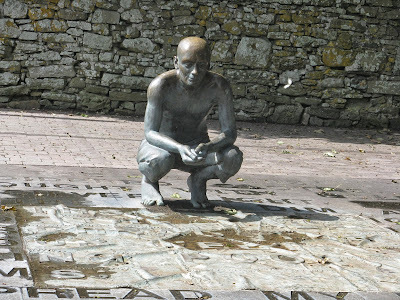 Beside the grounds of St Columba’s is this artistic feature, sculpted by Jackie McKenna. Tread softly because you tread on my dreams’. Yeats seems to be widely esteemed in this part of the world. 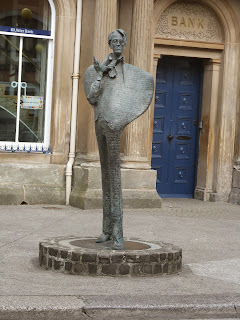 This statue of Yeats can be found in Sligo. 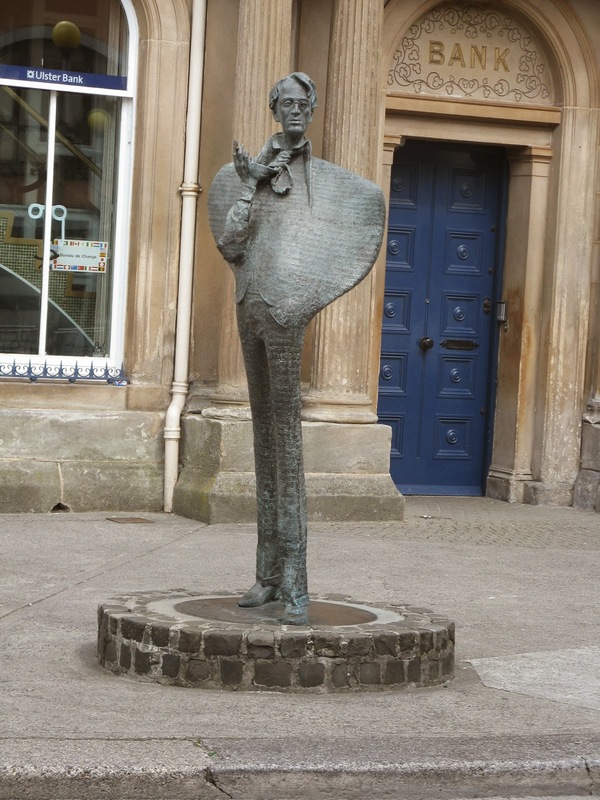 There is also a Yeats memorial building in Sligo, with displays providing information about his links with that region and other aspects of his life. 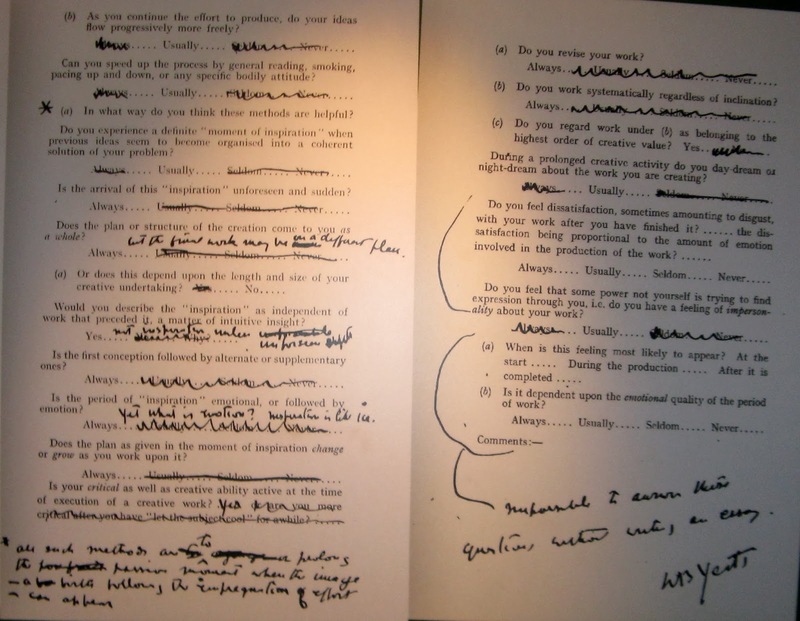 Yeats’ suggests that his creative efforts always involved day-dreaming. He never waited passively for inspiration and always worked systematically regardless of inspiration. 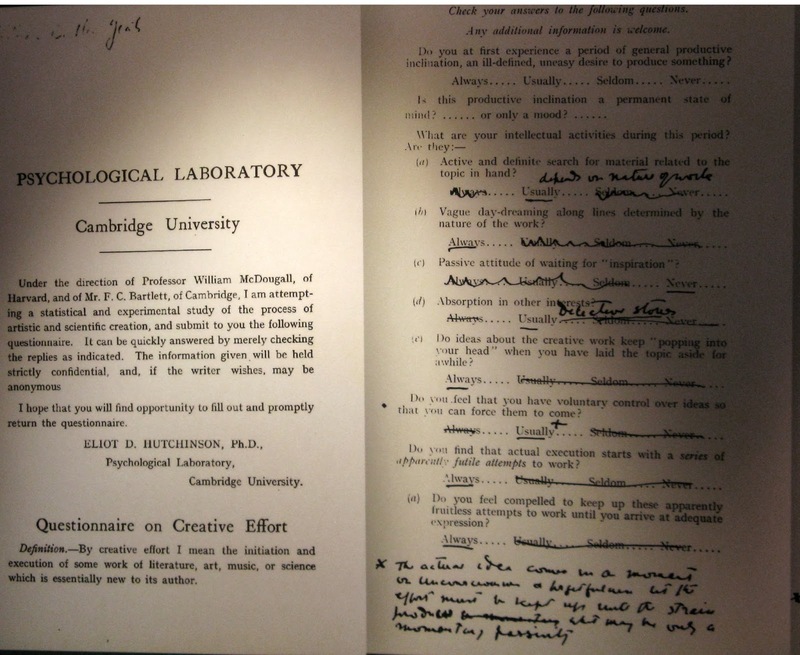 He claims that his critical ability was always active in his creative efforts. 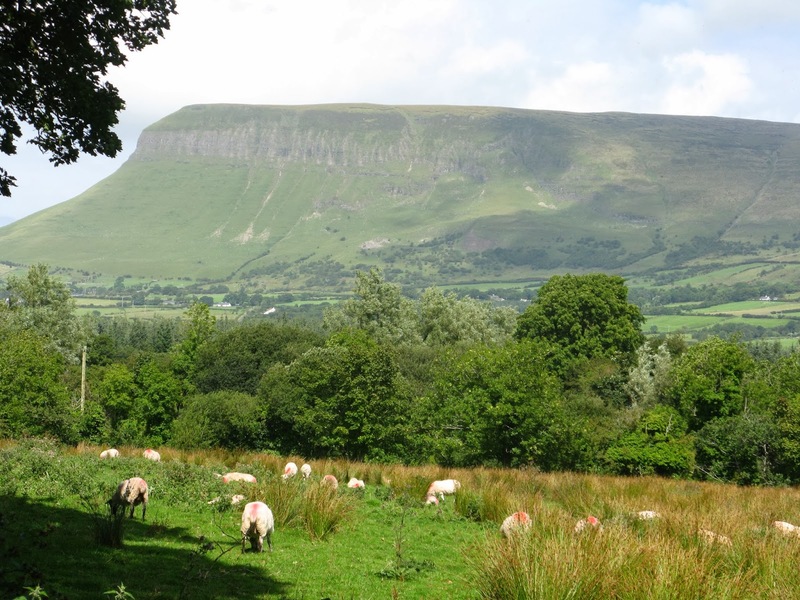 Yeats’ epitaph is the last stanza of his poem, ‘Under Ben Bulben’. Ben Bulben is a mountain close to where Yeats is buried. ‘If you are looking for answers as to what lies behind life and death, I can’t help you. You must look somewhere else. Horsemen, pass by’. That is one possible interpretation. However, reading the epitaph in the context of the poem, it seems that the horseman referred to is mythical superhuman creature ‘with an air of immortality’. We are told in the poem that such horsemen and women now ‘ride the wintry dawn’ ‘where Ben Bulben sets the scene’. And ancient Ireland knew it all’. I think Yeats wants us to view life and death through the cold eyes of mythical god-like beings of the ancient world. That perspective leaves me cold. Is it not better to look at life and death through human eyes? Perhaps contemplating whether those who have gone before have had happy lives can help us to consider how best to live our own lives. This is one of the most popular posts on my blog. I urge visitors to take a look at the comments provided below, some of which disagree with my understanding of the epitaph. Confusion fell upon our thought." That hints too as to what poets he hold in great esteem. Thx for the content, Cheers! It just struck me that WB Yeats would probably have greatly enjoyed the thought that people might ponder the meaning of the words on his grave stone. I read the first two lines as an injunction to regard existence with a certain amount of detachment. The last line is elusive, although given the context, the horseman may be a stand-in for death. Yeats had no illusions about earthly mortality -- perhaps he is expressing hope (but not necessarily faith) that his spirit will live on. I agree somewhat with the post above. Yeats is perhaps exhorting a dispassionate view of life, which he certainly didn't practice in his own life. Maybe at the end he regards passion as not truly a raison d'être. Actions may be better separated from strong feelings, this sentiment is a little Buddist perhaps. Detachment and dispassion is advocated to the pilgrim to his tomb. However, Yeats has the wisdom and wit to realise that in the end such philosophical musings mean little to the plain person busy with day to day life, the casual passer by who glances at his grave, hence horseman pass by. Life goes on with or without him. I agree with Mary O'Connor. Another brilliant artist, Thelonious Monk, played many versions of the 1930-era song, Just A Gigolo. The original tune was sung in the voice of a washed-up veteran of World War I. It ends with Ms. O'Connor's summation of Yeats' message. Monk recorded six or seven versions of the song, all without lyrics and varying in tone from happy and upbeat to darkly somber. I can't help but think that Monk felt he was kind of a gigolo--something not to be ashamed of but at least contemplated--to turn over and look at from all angles. And by extension, all of us but the most saintly all gigolos if we cast a cold eye on ourselves. Performing our poetry, performing our music, performing whatever, until the lights go out. Yates saved his best expression of humility for his tombstone. Thanks for drawing attention to the relevance of the words of "Just a Gigolo". I have heard the song many times. It would be nice to think that is what Yeats meant, but I am not so sure. It doesn't seem consistent with the "cold eye". Winton Bates: “I think Yeats wants us to view life and death through the cold eyes of mythical god-like beings of the ancient world. It is an enigmatic poem that provokes enigma. “Exhorting” a dispassionate view of life? Yeats? I hardly think so. Rather he was clearly deeply (the Spanish word “metido” comes to mind) entwined with it, provoked by his creative self to challenge sleeping minds with waking and reaching both within themselves and to their external history. Within almost anything he wrote can be seen meditations, however thinly outlined, of love, mystical and esoteric subjects. His other early poems, which hold meditations on the themes of love or mystical and esoteric subjects, reflect what was turning and rising in his own soul, or mind. It is said of Yeats that from an early age he was fascinated by both Irish legends and the occult. And, though it is further said he largely renounced the transcendental beliefs of his youth, he continued to be preoccupied with physical and spiritual masks, as well as with cyclical theories of life. To say that people have spiritual masks is a face slapping challenge to impassionate life. Indeed. Daydreaming is a powerful creative process. Anything that can be imagined can be created. It will not wait for inspiration, but will supply it as necessary. His selection of those four lines bear the weight of all the ones above them in his poem “Under Ben Bulben”. He references a powerful physical thing, Ben Bulben, that is almost an entity. I would argue it becomes one when brought to life by the ancient stories surrounding it. I think Yeats does so in his poem. Is he not saying that the physical flesh must do the work of making art, an ultimate mystical work, to join the soul of man to “god.” As do they join man’s immediate interest in life with the ancient folk-soul. “Where Ben Bulben sets the scene. And so does he exhort the reader. read "The wWite Goddess by Robert Graves, Poet Laureate and mystic. It's a dictionary of poetic myth, among other things. Greetings, and thanks for your post & photo. I hope one day I can go to Ireland and track Yeats's undying greatness, just like you did. Back to the topic, I'd like to add some possibility to it. In ancient China, there is a phrase said " Human life is just like a white horse pass by a tiny crevice, it's only a blink of time." This phrase comes from the philosopher Zhuangzi's book, "Zhuangzi: Knowledge travel to the North". And the story in the book is that, when Confucius asking Laozi what is "Zhi Dao(至道,the basic reason of everything)", and Laozi answered with this phrase, and told Confucius that either life or death is inevitable and common in life, it is just a change of matter, there's no need to happy or mourn. But "Dao" is the only eternity through a man's spirit. If Yeats did take this story in his mind, then perhaps he agreed Laozi by writing these lines. This is just my thought, and sorry for my grammar mistakes, I'm not an English speaker. Menge Tian: Thanks very much for your contribution. Your explanation seems to fit well with Yeats' interest in Daoism. Many thanks also to others who have provided comments. I will be interested in any further thoughts people might have. Sorry, Mengke Tian. As a person whose name is often misspelt I should be more alert! Knowing that life throws both fortune and misfortune at most people he seems to be suggesting that a degree of calm dispassion is the best way to deal with both? I am from the plebian self educated human subgroup. So my humble take on the epitome may reflect just that fact in the company of “superior” academians. 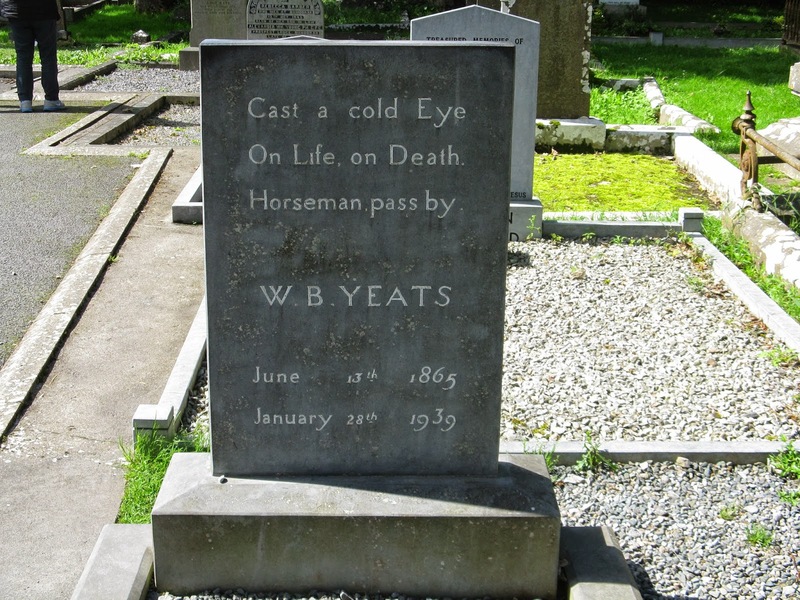 During a trip to Ireland I spend a long time at Yeats’ grave site trying to figure out the obvious riddle of the “cold eye and the horseman”. Cemeteries are mostly quiet and reflection comes a bit easier. But it didn’t.....then; yet lingered in my thoughts. Some time later I did a photo shoot in another abandoned cemetery of my wife-to-be, posing on the derelict tombstones. For some reason, cemeteries always intrigued me and I would often stroll there just to soak in the remnant energy forgotten there by death. Don’t take this trip too seriously (cold eye). Yeat's epitaph invites reflection and comment. then followed by mystery of third line - how connected to first lines? The 4 horseman of the apocalypse are conquest, war, famine, death. The spitaph addresses a single horseman. If the first, then a wish that gravesite remain free of of foreign government. including suppressed uprising of 1916 (100 years ago as I write). If the fourth, that horseman too has no hold, as long as the poetry is read. Sorry David, I was not able to edit your comment as suggested. Thanks for adding your view. My one wish,is you wake one day and say " that's enough I need no more"
I read the complete poem and I believe he is saying ...My life is ending and it is now up to you, the living, to carry on. My advise is to learn from the wise people who have gone before, and be prepared to work. "Swear by what the sages spoke"
"Poets and sculptor, do the work"
"Irish poets, learn your trade"
In verse III of the poem he talks about emotions and says they occur in even the wisest man, and when "a man is fighting mad, Something drops from eyes long blind, He completes his partial mind". Man becomes fully engaged when emotional. Emotions and tensions are natural especially when a man has not found his destiny, known his work, found a mate i.e. lived a life. Given that Keats lived a life, and no doubt when he was alive cast a passionate eye on life, my interpretation of his epitaph is: If you have made the trip to visit my grave (the horseman) don't stop, pass on by, as I am dead and I now " cast a cold eye on life, on death". Spend your time with someone who casts a passionate eye on life and by all means read and learn from my poetry! I recently had a friend pass away that was life long student of poetry and the work of W.B. Yeats. My friend was also a life long alcoholic and troubled soul to which he aligned his past shortcomings with his favorite poet ... W.B. Yeats. I received a passage from Under Ben Bulben from my friend several years ago, a gift prior to his passing, in framed-matted picture frame. "Title IV ... Poet and sculptors do the work Nor let the modish painter shirk What his great forefathers did, Bring the soul of man to God, Make him fill the cradles right ... Measurement began our might: Forms a stark Egyptian thought, Forms that gentler Phidias wrought." I don't believe W.B. Yeats selected this passage to forever rest on his gravestone, but most likely this passage was selected by a loved one or family member that understood his beliefs. The loved one that understood his distain for the hindering nature of man. The horseman simply pass through this world measuring and blaming others for life's shortcomings. "Bring the soul of man to God, Make him fill the cradles right." I read with great appreciation such thoughtful and soulful musings. This is what can come of great spirit and the creation of great art,the most we can do as humans, pass by all the rest! Read standalone, I regard the phrase to be an essentially nihilistic take on things. 'Cast a cold eye on life, on death'. In other words, there's no intrinsic meaning to life. We exist. That's that. Perhaps Yeat's meant that we should regard life (and our inevitable passing - presumably, the visiting of the fourth, pale horse) as dispassionately and without angst as possible.